Warlords and foreign powers were the major enemies of China's national revolution, and most warlords attached themselves to foreign powers to extend their influence. For example the Wan and Feng were pro Japanese and the Zhi factions were pro British and American. 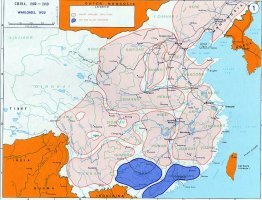 Before the Sino-Japanese war of 1894-1895, there was not in China any national army; each province had its own independent military force, subject to the provincial authority only, and paid out of the provincial revenues. Being poorly paid, armed and equipped, without any military training, without experienced officers and generals, these forces looked rather like armed bands than anything like an army. Under the monarchy each of the 22 provinces was ruled by a Viceroy placed over one, two, or three provinces, or by a Governor over a single province, either under a Viceroy or depending directly on the central government. In August, 1910, in addition, a Commissioner for Foreign Affairs was appointed to each of the more important provinces, to rank immediately after the Treasurer - a step which marked the growing importance of foreign relations in Chinese eyes. The regional turmoil that followed the Chinese revolution in 1911 soon devolved into the country-wide depredations of the so-called "Warlord Period" (1916-1928), during which local leaders contended ruthlessly for power, and the struggle between what would later become the Nationalist and Communist actions first began to coalesce. Following Yuan Shi-kai's death in 1916, China was fractured by the establishment of regional military governments. The main activity of the military governors was to amass fortunes at the expense of the state and of the people, and to satisfy their vanity by maintaining large armies which were employed mainly for the purpose of looting and plundering. Their chief interest lies in fortifying themselves in the respective provinces where they were stationed. Not only were they reluctant to contribute the prescribed sums to the national coffers, but they demanded of the central government such material rewards as they deemed due them for the military services they claimed to have rendered. Even foreign loans raised by the Peking government were as often as not utilized to quiet the clamorous and petulant military functionaries. The anachronism of the whole system was beyond the imagination of Westerners. Viewing as illegitimate the internationally recognized "Government of the Republic of China" in Beijing controlled by the Beiyang military regime, Sun Yat-sen returned to his southern home province of Guangdong. There, in August 1917 in the city of Canton, he began the work of rebuilding an ROC government faithful to the ideals that had inspired the 1911 revolution. In support of that larger task, in 1919, Sun and his confederates completed a thorough reorganization of the Kuomintang (KMT) - the Chinese Nationalist Party, which had been formed in Beijing in 1912 by merging elements of the Tong Meng Hui and various other political groups-along the lines of the present-day KMT. When, in the summer of 1917, General Chan-Hsun wanted to come to Peking with his queued troops, he seized and arbitrarily used the government railway between Nanking and Tientsin, financed by England and Germany. This unfortunate precedent was followed, in the spring of 1918, by General Chang Tso-lin, Military Governor at Mukden. This Manchurian general, who started his career as a bandit, took possession of the MukdenPeking railway, financed and superintended by England, to transport his soldiers to Tient-sin. His pretext in taking this extraordinary course was to urge the vacillating President Feng to take a more decided stand and speed up military operations against the southern revolutionaries, but his real motive was to intimidate and bully the Government into according him a higher position. The general demanded the creation of the post of Military Inspector General of the Three Eastern Provinces (Manchuria) and his own appointment to that post. In 1917 General Lu Yung-ting, who had risen to prominence from the unsavory class of free booters, wrested from the Peking Government the high-sounding title and remunerative post of "Inspector-General of the Two Kwangs." Even more notorious a case of political blackmail is the exaction by General Lung Chi-kong of the profitable position of Inspector General of Mines of the Two Kwangs. A lieutenant of the late President Yuan Shi-kai, General Lung, was sent to Canton by the deceased President in 1915 with instructions to suppress revolutionary activities there. When the Third Revolution came to an end by the sudden death of Yuan Shi-kai in June 1916, the new administration at Peking desired to remove General Lung from Canton. But Lung had a formidable army which he threatened to employ in a manner by no means agreeable to Peking, should the central government deprive him of official honors. So Peking sought solution for the difficulty in the usual expedient, creating for the general the remunerative post of Inspector General of Mines in the Two Kwangs. Not satisfied with this, the general took his army to Hai-nan Island off Canton, where he has since been firmly entrenched, collecting taxes at his will and expending the money thus raised as he pleases. Early in 1918 a most glaring case of political blackmail was reported from Peking. When Yochow was captured by the Southern rebels in January, the central Government sent General Feng Yu-hsiang to the South, entrusting him to combat the revolutionary forces on the Yangtse. The general started on his way, but when he arrived in Chi-chow on the Yangtse he refused, no one knows for what reasons, to proceed any further. On the other hand, he sent Peking telegram after telegram, all couched in dictatorial terms, urging the immediate suspension of hostilities between the North and the South. In a most arbitrary manner he detained six steamers of the China Merchant Navigation Company, exacted money from the revenue collecting offices in the neighborhood of Chi-chow, and commandeered $70,000 from the Salt Transportation Office and the Central Tax Office. Under a nominally centralized -regime, there has never been a clear distinction between national and provincial powers and functions, and the extent to which the province was subservient to the capital depends, on the one hand, on the pleasure of the governor, and on the other, on the personality of the head of the Central Government. By 1918, the Prime Minister in Peking, General Tuan Ch'i-jui, in order to command the sympathy and support of the Northern governors, had to shape his policy in such a way as to make it acceptable to them. He had to meet all their demands and to tolerate their arrogance. On many occasions they had shown themselves indifferent to national welfare, and even to the welfare of the Northern military party, merely pursuing their personal interests, and quibbling over their petty jealousies and intrigues. With the goodwill of these Northern governors, as of 1918 General Tuan Ch'i-jui held the reins of the Central Government, but it was doubtful how long their goodwill would last and to what extent he can afford to tolerate their unscrupulousness without endangering his own authority and prestige. A continuance of such conditions must be fatal. If an army commander, governing a province, directing its civil and military administration, and having the power to dispose of its revenue and resources according to his own wishes, were allowed to defy the authority of the Central Government and to silence any dissentient voice by arms, the inevitable result would be a break-up of China into many provincial units, independent of each other and often fighting among themselves. A break-up of this kind had happened at several periods of Chinese history, notably at the end of the T'ang dynasty, when provincial governors, especially those on the Northern frontier, overruled and finally overthrew the reigning Emperor, and divided the Empire among themselves; each occupied, ruled, and exploited a province or a group of provinces for various lengths of time. Fengtien (Mukden) Faction: - Headed by General Chang Tsolin of Mukden, who was in Peking trying to organize a cabinet to suit his policy. His "sphere of influence" included Manchuria and Inner Mongolia. Chihli Faction: - Headed by General Tsaokun and General Wu Peifu, claiming as its sphere Chihli, Shensi, Hupeh, and Honan Provinces. Anhui Faction: - Headed by General Tuan Ch'i-jui, former prime minister, and including Chekiang, Fukien, and Shantung Provinces under its influence. Kwangtung (Canton) Faction: - Headed nominally by Dr. Sun Yatsen but really by General Chen Chien-ming, and claiming Kwangtung and Kwangsi Provinces as its sphere. Kwangsi Faction:-Headed by General Lu Yuntien, an ex-bandit. At present this faction controls only a section of Kwangsi Province, but a year ago it controlled the whole of Kwangsi and Kwangtung Provinces. 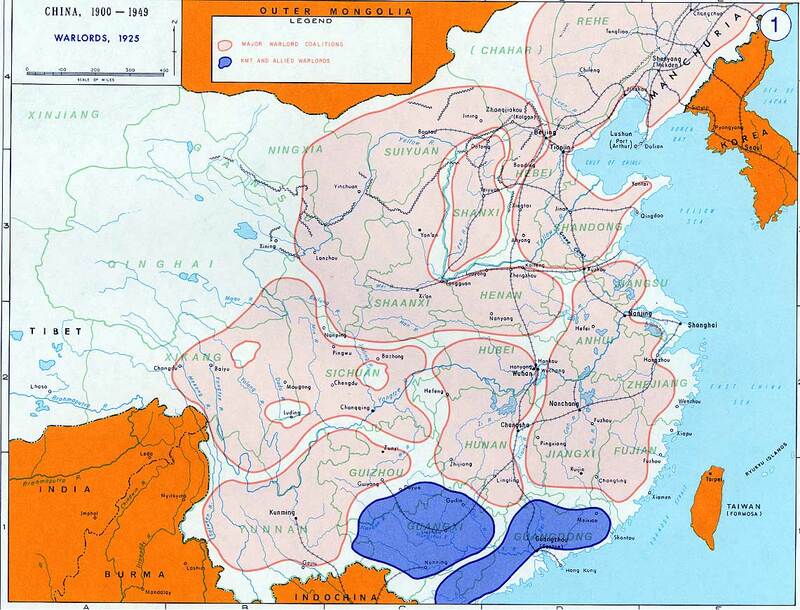 Semi-Independent Provinces: - Hunan, Kweichow, Yunnan, and Szechuen Provinces, each claiming a sort of autonomy. In 1921, Sun Yatsen assumed the presidency of the Canton-based government. When conflict between regional warlords erupted in 1922, Sun issued a manifesto calling for the unification of China. Under his leadership, the ROC government in Canton established the Whampoa Military Academy to train an officer corps dedicated to accomplishing that mission by force if necessary. The Whampoa Military Academy was inaugurated on June 16, 1924. Sun appointed Chiang Kai-shek as commandant of the academy. The troops of the Academy put down the "Shangtuan Rebellion" in October 1924. On November 10, 1924, Sun called for a "national people's convention" to bring China's regional leaders together and negotiate unification. Two weeks later, Duan Qi-rui became the provisional chief executive of the Beijing-based government. Sun, in his capacity as head of the Canton-based government, traveled north to hold talks with Duan. While in Beijing, however, Sun died of cancer on March 12, 1925, at the age of 59. The National Revolutionary Army defeated the warlords Wu Pei-fu, Sun Chuan-fang and Chang Tso-lin and completed unification. The troops of the Academy launched two eastern expeditions to unify Guangdong Province in 1925. Two Eastern Expeditions were launched in 1925 in a move to eliminate menace to the Guangzhou revolutionary base from enemies. In his military report to the National Assembly, Chiang Kai-shek pointed out that Guangdong Province in 1924 faced enemies from inside and outside: the inside enemies referred to Chen Jiong-ming, Lin Hu, Hong Zhao-lin, Deng Ben-yin and Shen Bao-fang; the outside enemies referred to the Hong Kong British people and the Beijing Government. Simply said, Guangdong was then under the threat of different spheres of influence and this was precisely the reason for necessity of the Eastern Expedition. Sun's untimely death left the southern government in the hands of a 16-member steering committee. The committee established a revamped national government in July 1925 and, 11 months later, appointed Chiang Kai-shek commander-in-chief of the National Revolutionary Army. After victory in the two eastern expeditions, the Revolutionary Government was reorganized on July 1, 1925 to form the Nationalist Government, and the various military units were reorganized to form the National Revolutionary Army in August 1925.